1. Cook noodles per package directions, with cubes for flavor, until firm. 3. In a saucepan, melt butter. 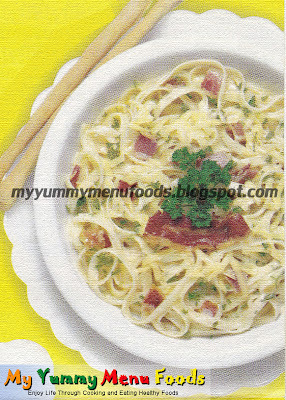 Over low heat, and add cream and the rest of ingredients except the bacon and parsley. Pour sauce over noodles and blend well. Top with bacon bits and parsley.